Why did the Titanic sink, despite being considered unsinkable? The conventional answer is the design of its watertight compartments was flawed: the watertight bulkheads were limited in height to a few feet above the waterline. The ship was designed such that if the first few compartments were flooded, the flooding would be contained by the watertight bulkheads. But the iceberg ripped open a gash almost a third the ship’s length, flooding the first six compartments. As the ship’s bow sank, water poured over the bulkhead into the seventh compartment, and so on, until the ship’s bow sank deep enough to bring the ship almost vertical, at which point the hull broke roughly in half–hence the two hull sections discovered on the bottom of the Atlantic in 1985. But further analysis has revealed this isn’t the only reason Titanic sank. It turned out the ship’s hull plates were brittle due to high sulfur content in the steel, especially at cold temperatures (the water was near freezing at the time of the wreck). Rather than deform as the iceberg scraped against the hull, the plates and rivets fractured, opening the gash that sank the ship. The technologies of the early 1900s enabled shipbuilders to construct enormous ships almost 900 feet in length capable of steaming at 24 knots, transporting passengers across the Atlantic in comfort, but the technologies that made such ships and transits low risk were not yet developed. The fact that large ships and powerful engines could be built created the illusion of low risk, because the risk factors were invisible until disaster struck. After the disaster, the flaws in the design of the watertight bulkheads, the inadequacy of the lifeboat requirements (there were not enough lifeboats for the crew and passengers), and the deficiencies in the wireless/radio requirements (ships were not required to have radio operators on duty 24 hours a day) were all obvious. But the flaws in the steel plates and rivets would remain invisible until the technologies of steel production finally caught up with the other shipbuilding technologies. And better detection and tracking of icebergs would have to wait for radar and better navigational technologies. Our financial system is like the Titanic: technologies such as high-frequency trading (HFT) and innovations such as securitization and complex derivatives have enabled major players to construct an enormous, fast-moving financial system that creates the illusion of low risk because the risks are not visible until disaster strikes. The Global Financial Meltdown of 2008-09 was a close call, the equivalent of the Titanic veering off and barely missing the iceberg. In response, authorities imposed a variety of new regulations that are the equivalent of changing the regulations guiding lifeboats and radio operations. But these regulations did nothing to address the risks created by the technologies of financialization that have leapfrogged safety systems and the real economy. In effect, the idea that the financial system is unsinkable remains intact, even though the flaws in its design (the equivalent of the watertight bulkheads) and its core technologies (the equivalent of the flawed steel plates) remain invisible. The financial system’s huge size and apparent strengths have created a false confidence that it is unsinkable, and the ineffective regulations imposed after 2008-09 have only added to the illusion that the risk of a complete collapse is low. All that has been accomplished since 2008-09 is there are a few more lifeboats and better communication when disaster strikes. But the risks of financial disaster have actually increased since 2008-09, as participants have bypassed regulations via shadow banking, dark pools,etc., and deepened their dependence on HFT skimming via superfast trades executed by superfast computers. 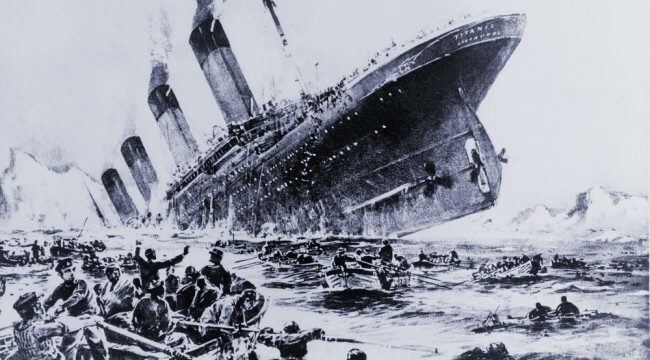 The “unsinkable” global financial system is rushing headlong toward its encounter with the iceberg, while the passengers and crew remain supremely confident and unaware of the risks, risks that will only become “obvious” after the global financial system has broken in half and sunk to the bottom, destroying most of those who believed it unsinkable.